Over the past one hundred years, Pittsburgh experienced many changes in architecture and the city’s skyline. Due to the wealth generated during the industrial revolution, the area’s business leaders hired nationally known architects to transform Pittsburgh into a more modern city. The Carnegie Building (1895). Alexander Wadsworth Longfellow, Jr. (August 18, 1854, Portland, Maine – February 16, 1934, Portland) was an American architect and nephew of poet Henry Wadsworth Longfellow. He was one of the founders of the Boston Society of Arts and Crafts, active in the Marine Museum of the Bostonian Society, and a trustee of the Boston Museum of Fine Arts and the Boston Athenaeum. The building served as the world headquarters of Carnegie Steel Company, a steel producing company of the late 19th century created by industrialist and philanthropist Andrew Carnegie to manage steel mills in the city. The structure was completed in 1895, and stood as the first steel-framed skyscraper in Pittsburgh upon completion. The Frick Building (1902). Daniel Hudson Burnham, FAIA (September 4, 1846 – June 1, 1912) was an American architect and urban planner. 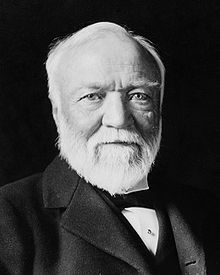 He took a leading role in the creation of master plans for the development of a number of cities, including Chicago and downtown Washington DC. He also designed several famous buildings, including the Flatiron Building in New York City and Union Station in Washington D.C. The tower was built by and is named for Henry Clay Frick, an industrialist coke producer who created a portfolio of commercial buildings in Pittsburgh. The Oliver Building (1910). Daniel Hudson Burnham, FAIA (September 4, 1846 – June 1, 1912) was an American architect and urban planner. He took a leading role in the creation of master plans for the development of a number of cities, including Chicago and downtown Washington DC. He also designed several famous buildings, including the Flatiron Building in New York City and Union Station in Washington D.C.
Koppers Building (1929). Graham, Anderson, Probst & White was a Chicago architecture firm that was founded in 1912. Graham, Anderson, Probst and White was the largest architectural firm under one roof in the first half of the twentieth century. Their importance to Chicago’s architectural legacy cannot be overstated. Grant Building (1930). Henry Hornbostel (1867–1961) was an American architect. He designed more than 225 buildings, bridges, and monuments in the United States; currently 22 arelisted on the National Register of Historic Places. Gulf Building (1932). Trowbridge & Livingston was an architectural practice based in New York City in the early 20th century. The firm designed several notable public and commercial buildings in the city. Among the most famous are the neo-Baroque St. Regis Hotel (1904) and the former department store for B. Altman and Company (1905), both on Fifth Avenue; the 37-storey Bankers Trust Company Building (1912) at 14 Wall Street; and the J. P. Morgan Building (1913), across the street at 23 Wall Street. Cathedral of Hope – East Liberty Presbyterian Church (1935). Ralph Adams Cram FAIA, (December 16, 1863 – September 22, 1942), was a prolific and influential American architect of collegiate and ecclesiastical buildings, often in the Gothic style. The firm’s win of the ‘United States Military Academy at West Point’ project in 1902 was a major milestone in his career. University of Pittsburgh Cathedral of Learning (1936). In November 1921, with aid from the Mellon family, the University bought the plot, and began plans for a proper university building on the site. One of the foremost Gothic architects of the time, Philadelphian Charles Klauder, was hired to design the tower. *Some of the information included above from was obtained from Wikipedia.com sources. This blog will focus on the Pittsburgh-area buildings that are no longer standing. 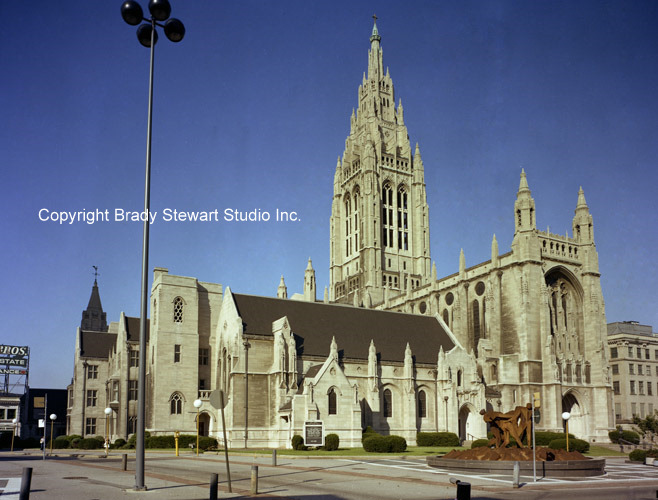 The images of the buildings can be view by clicking the following link or copy and paste into your browser; http://bradystewartphoto.photoshelter.com/gallery/Pittsburgh-Buildings-That-Are-Gone/G0000u6LTlRWbLk0/. 1) Jenkins Arcade – With entrances on both Liberty and Penn Avenues, the Jenkins Arcade was the first indoor shopping mall in the United States. The Jenkins and Empire Buildings were torn down to make room for the new Fifth Avenue Place. 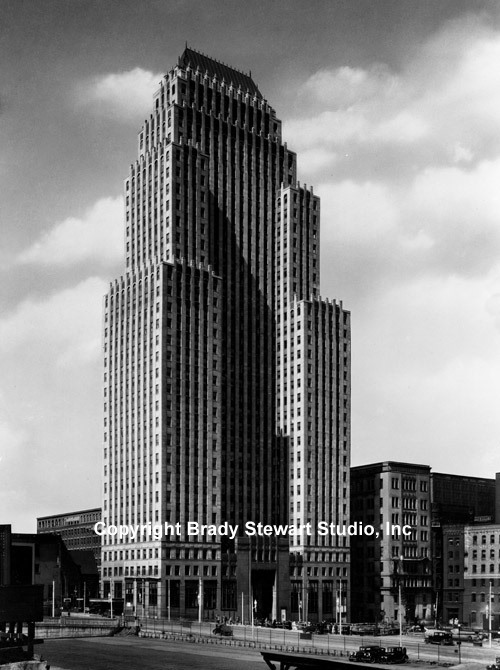 Brady Stewart Studio maintained an office in the Empire building for nearly 15 years. 3) The Point Building – Located at the corner of Penn Avenue and Water Street, the Point Building was one of the most recognized building in the city. The area near the Point and Manchester bridges was one of the most heavily traveled areas of the city of Pittsburgh. The building was demolished to make room for the new Gateway Center. 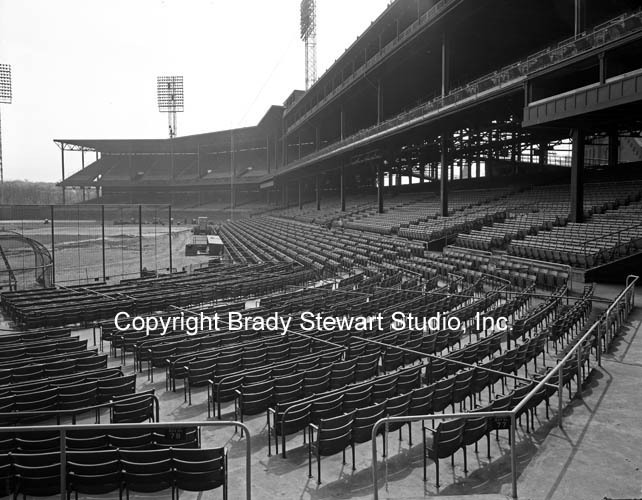 4) Forbes Field – Built in 1909, Forbes Field was the home of the Pittsburgh Pirates and the Pittsburgh Steelers. The stadium was named after British general John Forbes who fought in the French and Indian War, and named the city in 1758. Forbes Field was torn down in 1971 after the building of the new Three Rivers Stadium. The area around the former Forbes Field is now part of the University of Pittsburgh. 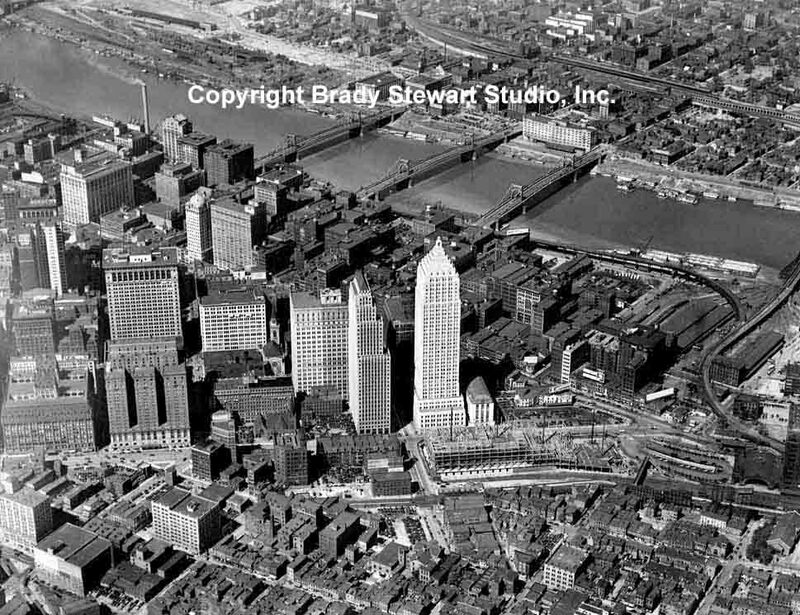 5) The Point Area – The two photographs of the Point area of Pittsburgh shows the buildings and parking lots before the start Renaissance I in 1946. Title One of the Housing Act of 1949 provided the means in which to begin. 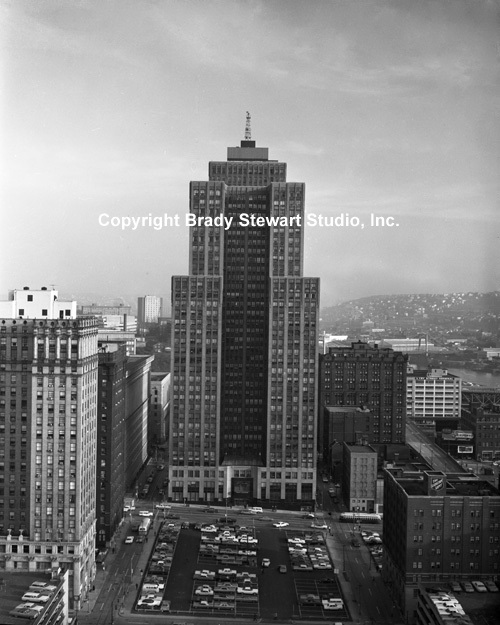 By 1950, vast swaths of buildings and land near the Point were demolished for Gateway Center. 6) The Pennsylvania Railroad Station – The original Union Railroad Station was built-in the late 1860s and was destroyed by fire in 1879. The second Union Station was built-in 1879 and again burned down in 1896. From 1898-1903, the next Union Station was rebuilt with stone and brick. The name changed to the Pennsylvania Railroad Station in 1912. The train station was remodeled and turned into a condominium project in the late 1980s. 7) The Moon Run Airport/Pittsburgh International Airport – The new airport opened on June 3, 1952 and was closed when the new Midfield terminal was opened in 1992. The original terminal and other buildings were demolished in 1999. 8) The Duquesne Brewery on the South Side of Pittsburgh – The South Side operation was built-in 1950 to support the growth of the Duke brand. During the 50’s, the Duquesne Brewery was one of the top 10 brewers in the United States. Due to competition from the big national brands, the Duquesne assets were sold to competitor C. Schmidt & Sons Brewing Company of Philadelphia in late 1972. The Duquesne Brewery clock, a Pittsburgh landmark, was the largest single-face clock in the world when it was installed in 1933, advertising a soft drink. In 1960, the Duquesne Brewing Company purchased the sign and installed it in its South Side location. 9) Strip District of Pittsburgh – By the early 20th century the Strip District became a vibrant network of wholesalers—mostly fresh produce, meat, and poultry dealers. Soon auction houses rose around the wholesale warehouses and many restaurants and grocery stores were built to feed hungry shift workers at any hour of the day. By the 1920s The Strip District was the economic center of Pittsburgh. During the early 1930s, the Strip district became the home to many of the workers and families displaced by the Great Depression. One of my grandfather’s most famous photograph was taken during that time – Shanty Town. 10) Blue Dell Swimming Pool – The pool was built-in 1929 and was initially known as the “pool for the rich kids” because you needed a pass to get into the pool area. 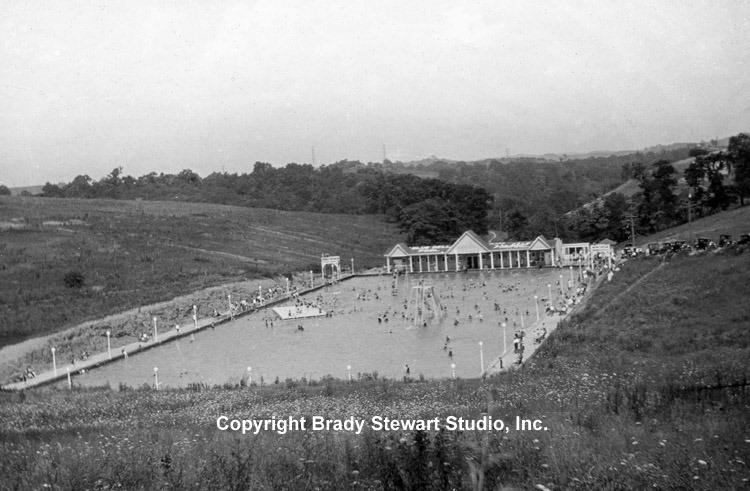 The pool was located in North Huntington (Westmoreland County) and was major attraction in the area for over 40 years. 11) Hotel Schenley in Oakland – The Schenley Hotel, designed by architects Rutan & Russell, opened in 1898. 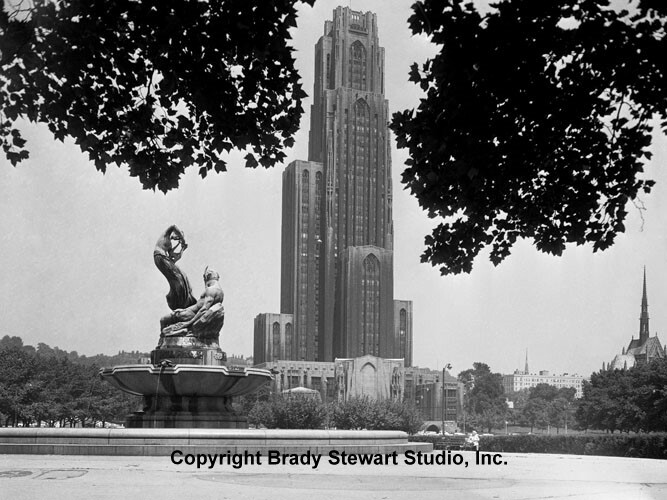 The Schenley was not just the place to stay in Pittsburgh as the 20th century began: it was where the young ladies of society came out, where couples married, and where one could dine on the haute cuisine of the day. 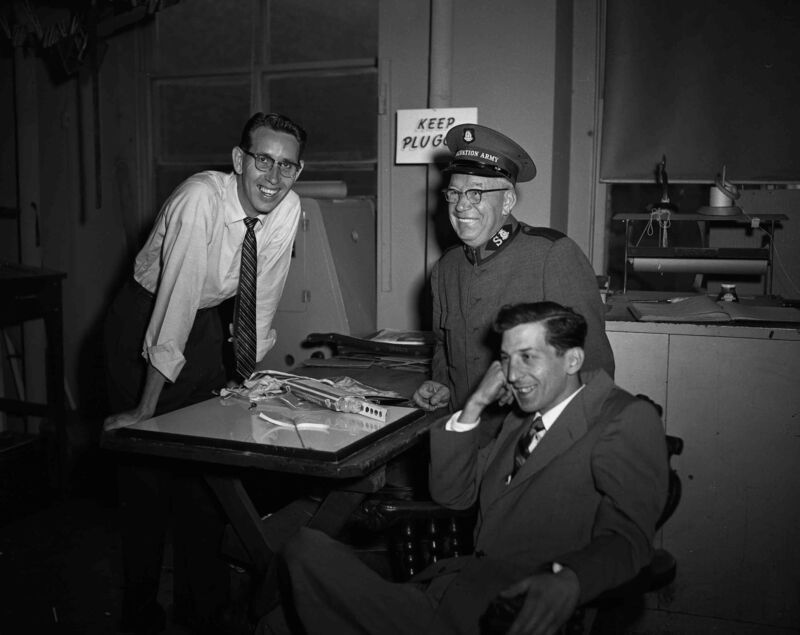 It was also the place where Pittsburgh power brokers met and many of the discussions leading to the birth of the U.S. Steel Corporation were held at the Schenley. The Hotel Schenley is now the William Pitt Student Union at the University of Pittsburgh. 12) The Civic Arena – Even though it is still standing, the Civic Arena (Mellon Center and/or Igloo), will be demolished soon to make room for a shopping/office complex. The building became expendable with the opening of the new Consol Energy Center in 2010. 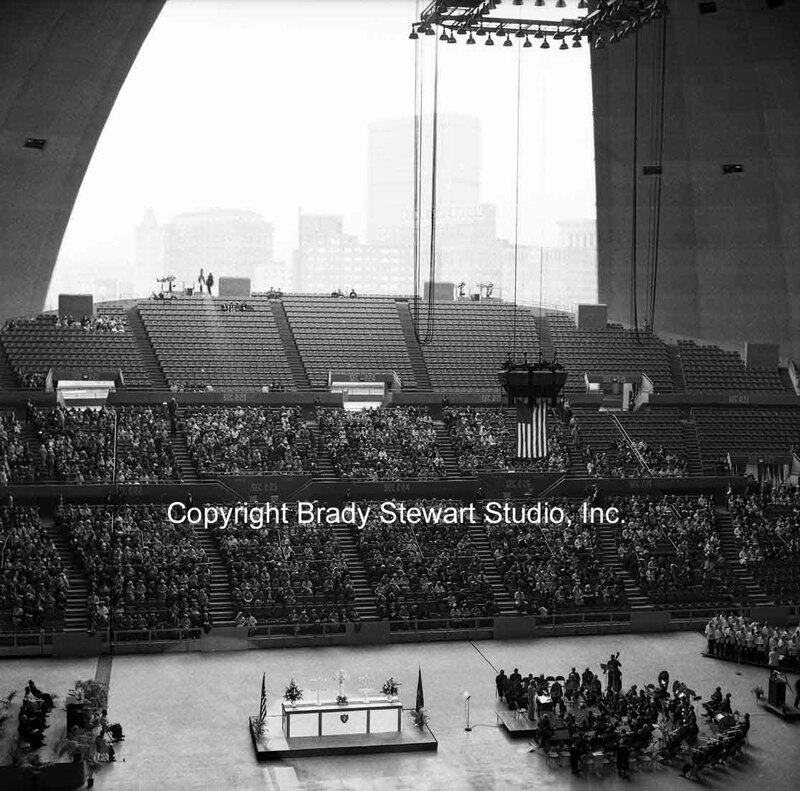 The Civic Arena images are the most viewed on our website. 13) Pitt Stadium – Pitt Stadium was a stadium located on the campus of the University of Pittsburgh in the Oakland section of Pittsburgh from 1925 to 1999. The stadium was also the home of the Pittsburgh Steelers from 1964-1970. the Stadium was demolished in 1999 to make room for other Pitt buildings. 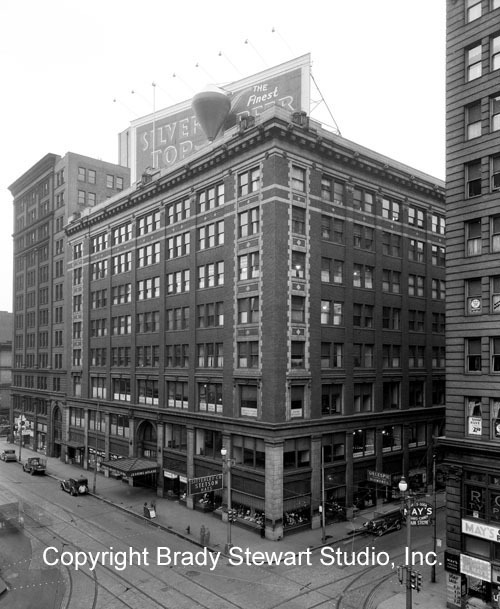 We have included other lesser known building in the gallery; General Electric Building, Imperial Power Building, & Municipal Hospital of Pittsburgh. 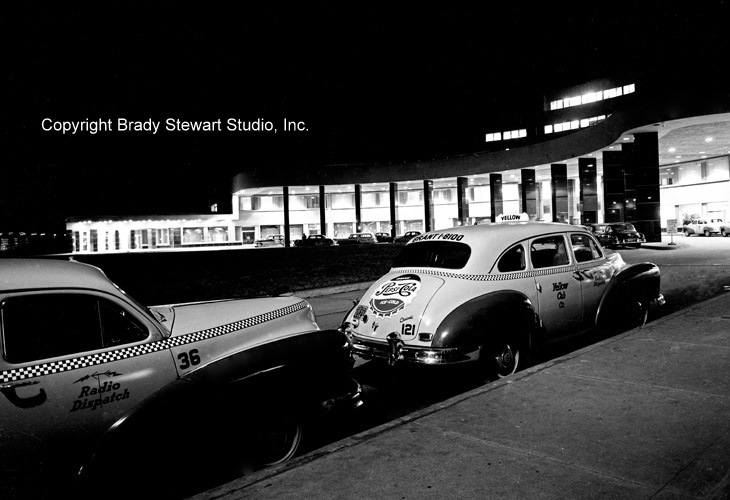 During the 70+ years of operation, Brady Stewart Studio worked a wide range of Corporations, Advertising Agencies, Printers, organizations and individuals. By definition, a Commercial Photography Studio, provides a wide array of photographic services including; location & studio photography, black & white and color prints, copy negatives of original prints, large format color and black & white transparencies of original art, photostats and screened prints for business printers, and 35mm slides for business presentations.